For many of you readers, when you hear the word “Tacoma” you think of the pint-sized pickup manufactured by Toyota bearing that name. Unlike what some companies have done creating unique marketable names for their products, Toyota didn’t invent “Tacoma” out of thin air. Rather, they borrowed it from a proud port city at the southern end of Puget Sound in the state of Washington. I’m talking about Tacoma, Washington, a city of 200,000 hardy souls living in the long shadow of Mount Rainier, an active, snow-capped volcano, another Pacific Northwest landmark whose name, like Tacoma’s, was borrowed by a car manufacturer for one of their models (in this case, for a mid-size luxury SUV from Buick called the Rainier). I will freely admit, with all the articles I’ve written about the Pacific Northwest, at times I must sound like a paid PR publicist for the Washington State Tourist Bureau. I can’t help it if that’s where I happen to live, and where I happen to live happens to be one of the most beautiful and alluring corners of the United States. I never have to travel very far from my front door to find something interesting to write about. I can only hope that my readers agree with me, at least somewhat. Back to Tacoma. This past week I attended a fund-raising event at a rowing club on American Lake, a lovely three-mile-long body of water at the south end of the Tacoma metropolitan area. 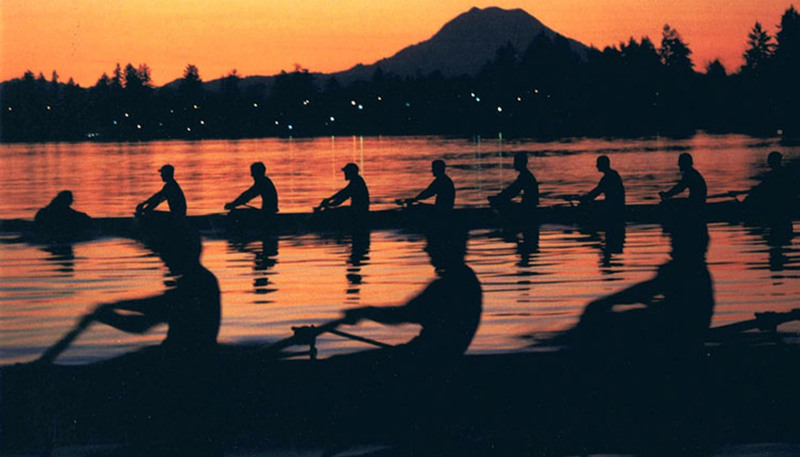 On a clear morning (and there are more of those in Tacoma than you might imagine, given the widely-circulated rumors of constant rain and cloud cover commonly associated with the region) rowers are treated to the dramatic sight of the sun rising over Mount Rainier. I used the occasion as an excuse to take visit two of Tacoma’s many attractions. If you’re ever in the Seattle area, you might want to consider heading south on Interstate 5 thirty miles to Tacoma and add some extra flavor to your visit. 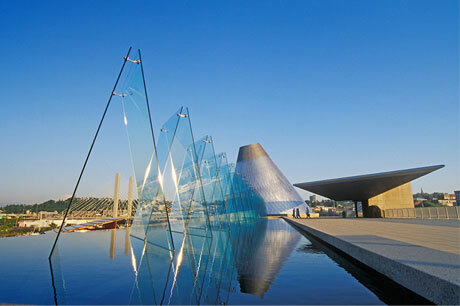 Two “must-sees” high on my list are the Museum of Glass and America’s Car Museum. 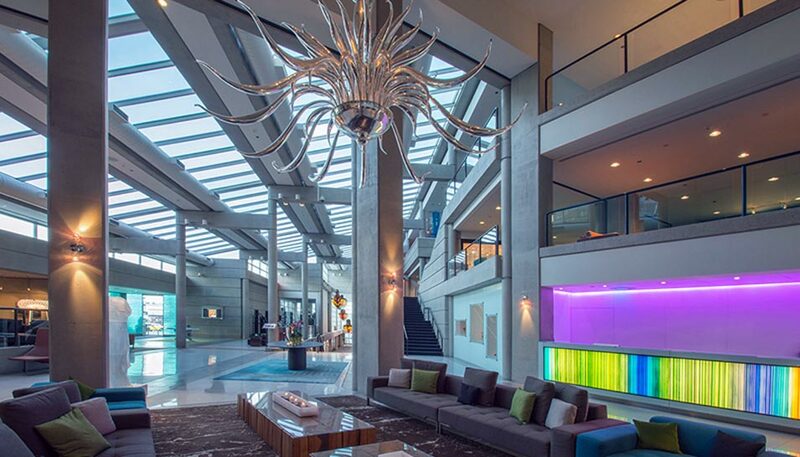 The Museum of Glass resides along a revitalized downtown waterway in a stunning glass-and-steel structure shaped like a glass-blowing cone with 75,000 square feet of total space and 13,000 square feet of gallery space. 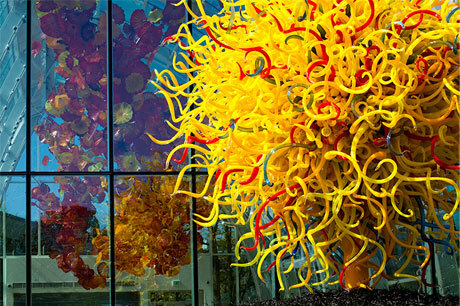 It was originally conceived of as a way to recognize the genius of Tacoma native Dale Chihuly, whose glass art wizardry is world famous. The Chihuly Bridge of Glass connects the museum to downtown Tacoma. The MOG features its own permanent collections plus an ever-changing series of special exhibits, a visiting artist program, and a variety of educational programs designed to nurture and inspire glass artists. A visit to Tacoma’s MOG will leave you feeling astonished at the beauty and imaginativeness of the glass-blower’s art. For more information on the Museum of Glass, visit their website, https://museumofglass.org. The LeMay America’s Car Museum features well over 300 cars from its own collection and on loan from private collections. On display is a unique selection of meticulously-restored domestic and foreign-made cars spanning the entire history of the automobile. Among their 10 featured exhibits this past weekend was “BMW – Propelling a Century of Innovation, celebrating the German marque’s 100th anniversary and covering the full spectrum of their creations from motorcycles to luxury cars to race cars. Another exhibit of interest, "Classics and Custom Coachwork,” highlighted a number of stunning cars from the 1930s, including creations from Duesenberg, Packard, Lincoln, and Mercedes-Benz. Based on this exhibit, you would never know there was a Great Depression going on when these cars were designed and built. For more information on America’s Car Museum, visit their website, https://www.americascarmuseum.org. Tacoma is a major international port, with miles of salt-water shoreline, a wide selection of seafood eateries, and many outdoor activities to keep you busy. For a better idea of interesting things to do in Tacoma, visit the following websites: https://www.tripadvisor.com/Attractions-g58775-Activities-Tacoma_Washington.html and http://www.traveltacoma.com/things-to-do/. Dominating the horizon to the south of Tacoma is Mount Rainier—also known as Mount Tacoma—a 14,409’ tall, snow-capped volcano surrounded by one of America’s greatest national parks. If you have an extra day to spend, a trip to Mount Rainier/Mount Tacoma is an unforgettable experience. Mount Rainier is considered one of the most dangerous volcanoes in the world, with a well-documented history of major eruptions and catastrophic mudflows (“lahars”). In fact, much of Tacoma sits on land known to have been innundated by lahars in centuries past. Doomsayers predict major destruction when the day finally comes when “The Mountain” as Tacomans like to call Mount Rainier decides to unleash the full extent of her fury another time, like her cousin 60 miles to the SSE, Mount St. Helens, did in 1980 when over 70 lives were lost, 230 square miles of timberland were devastated, and a cloud of volcanic ash was propelled into the upper atmosphere, were it circumnavigated the globe and deposited ash at sites as far as 1,000 miles away. Tacoma is famous for things falling down. In 1940, a newly built suspension bridge across the Tacoma Narrows nicknamed “Galloping Gertie: collapsed in a major windstorm. In 1993, demolition experts blew up the ASARCO Smokestack on the Tacoma waterfront at the site of an abandoned copper smelter.